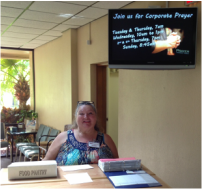 Our food pantry is a ministry to help needy families in our church as well as the community by providing non-perishable food items. The pantry is restocked through donations by church members and twice yearly food drives. If you have any questions concerning this ministry please contact the church office.